Rugged, reliable PLIDCO® Split+Sleeves are widely used for making permanent repairs to pipelines onshore and offshore. They are used for repairs to both high and low pressure and temperature pipelines carrying oil, gas, steam, chemical process and water. Their unique construction permits making the repairs while the line continues on-stream. PLIDCO® Split+Sleeves are designed for faster, easier installation. Steel GirderRings hold factory-installed packings firmly in place to prevent their displacement by leaking fluids during installation. Once the PLIDCO® Split+Sleeve is bolted in place, the seal is complete. It may be completely seal-welded with pipeline in operation. All PLIDCO® Split+Sleeves are designed so they can be seal welded unless otherwise specified. The PLIDCO® Split+Sleeve can be used to couple pipe if sufficient end restraint is provided such as with a PLIDCO® Clamp+Ring. The PLIDCO® Split+Sleeve has no end restraint rating in its unwelded condition. Standard working pressure is 1000 psig. 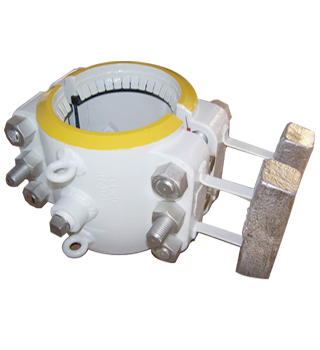 Fittings are tested to 1-1/2 times recommended working pressure. Available from stock in API pipe sizes 1-1/2? through 48?. Higher working pressures, longer lengths and other sizes available on request. Buna-N packing is standard, other packing materials available.